Brad`s Beach Bungalow, family friendly rental, 2.5 blocks to beach, walk to everything. 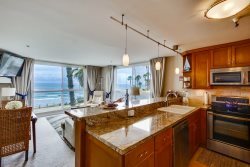 Next to two of our favorite restaurants in Pacific Beach (Brick and Bell Café and Isabel's Cantina), this newly remodeled apartment with central AC and heating, is so convenient, you don't need a car. It's the front unit of a triplex, two bedrooms/one bath, 728 square feet. Spacious living room with hardwood floors and 52" High Def TV with 200 channels including: ESPNews, NBA, NFL, MLB, CBS sports, Fox sports, Pac12, FX, Sundance, IFC, TCM, Hallmark, LMN, VH1, Disney Jr, Nick Jr, & lots of music channels. Turbo Speed Cable internet with Wifi and there is free nationwide plus Canada calling. The master bedroom has a king bed, desk, ceiling fan and TV. The second bedroom has two extra long twin beds plus a single roll out trundle bed, a TV/DVD and ceiling fan. There is also a queen blow up mattress in the storage room. The open kitchen has a tile floor and all new countertops, cabinets and stainless steel appliances. it's equipped with everything you need for cooking and dining at home. The open kitchen has a tile floor and all new countertops, cabinets and stainless steel appliances. it's equipped with everything you need for cooking and dining at home. Free onsite washer and dryer for your convenience. There is a shared (shared with middle unit) patio area in the front of the complex with a gas BBQ and a picnic table. Put your car in the single car garage and walk to whatever you need. There are three bicycles with helmets, three boogie boards, two beach chairs and sand toys for the kids. Two surf boards are in the storage room for shared use with middle unit. The team was superb...very friendly and helpful! Will likely return...great location and very nice property.